Explanation: Thunderstorms almost spoiled this view of the spectacular June 15 total lunar eclipse. Instead, storm clouds parted for 10 minutes during the total eclipse phase and lightning bolts contributed to the dramatic sky. Captured with a 30 second exposure the scene also inspired what, in the 16 year history of Astronomy Picture of the Day, the editor considers may be the best title yet for a picture (title credit to Chris K.). Of course, the lightning reference clearly makes sense, and the shadow play of the dark lunar eclipse was widely viewed across planet Earth in Europe, Africa, Asia, and Australia. 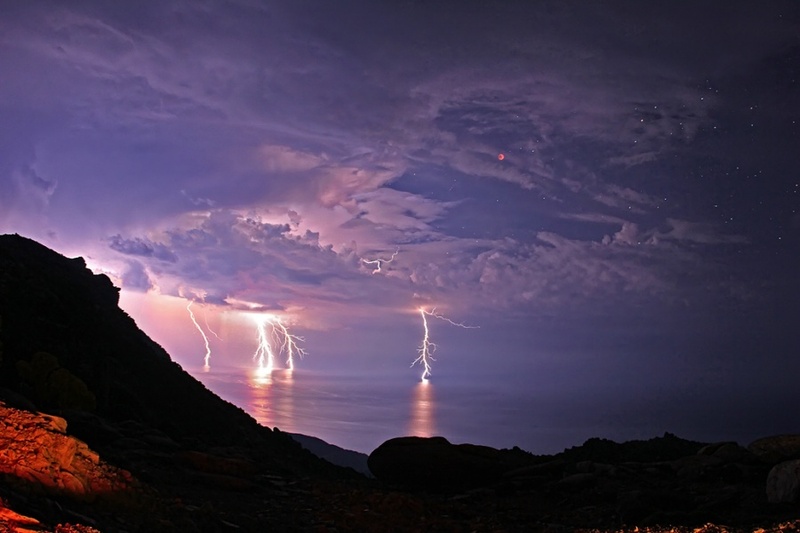 The picture itself, however, was shot from the Greek island of Ikaria at Pezi. That area is known as "the planet of the goats" because of the rough terrain and strange looking rocks.